In the last post, I spoke about the responsibilities parents of a horse crazy kid face when making the decision on horse ownership. In this post, we’re going to run through a few possible scenarios relating to siblings. If you’re dealing with an only child, say a silent prayer of thanks and skip this post (unless, of course, you want to feel all smug for not having to deal with the challenges listed below). For those of you whose horse crazy kid has siblings, keep reading, and take hope – there are ways to manage! Depending on your kids, your budget, and your point of view, this can either be the easiest or the most challenging scenario. If your kids are close in age, size, and physical ability, and get along well, you have the option of the siblings sharing everything from riding lessons to a riding helmet and a pair of riding boots. If you decide that horse ownership is right for your family – your kids can even share a horse or pony. However, this option does present challenges – especially if one child excels at lessons and the other struggles. Although we all want our kids to get along beautifully and share perfectly, you’ll need to be prepared to deal with frustration, envy, and a healthy dose of sibling rivalry. This scenario can be a tough one to handle, especially if the older sibling already feels that the younger one gets more attention or is spoiled. Taking time and making sure the older sibling has the opportunity to participate in favorite activities can be helpful. If the NHCK (Non-Horse-Crazy-Kid) dotes on their younger sibling, the horse experience can be a great deal of fun. Older siblings can do everything from play official videographer to chauffeur to groom. When you have an HCK (Horse Crazy Kid), there’s always room for another helper. As younger siblings often idolize their older brothers and sisters (at least when they’re very young), the younger NHCK may not present too much of a problem – except for the usual story of parents running in 10 different directions make sure all the children can participate in their chosen activities. As you contemplate the possibility of welcoming a horse into your family, make sure all of the family members are ready for the occasion. 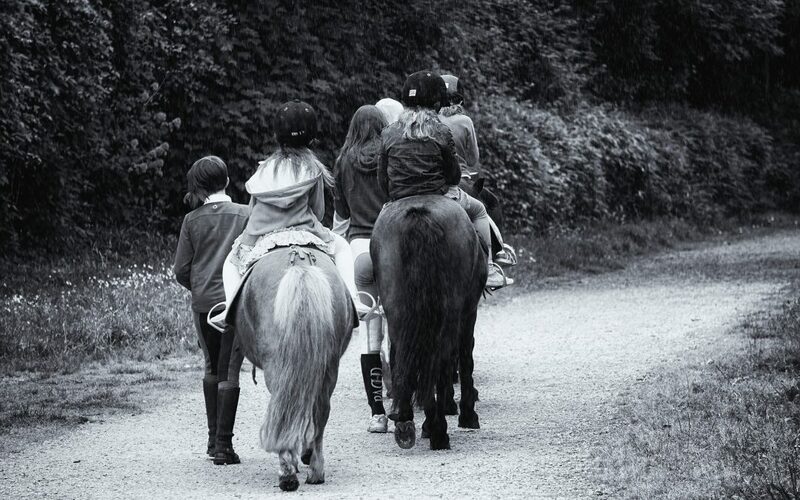 With some careful thought and preparation, horse activities can teach children everything from improved responsibility and communication skills to greater self-confidence and compassion. And your child’s NHC sibling may just surprise you and start showing some interest – and before you know it – you’ve moved up to Scenario 1! Welcome to being the parents of Horse Crazy Kids. Is this mistake hurting your relationship with your horse? Stay up to date with The Horsey Life! Sign up to get our newsletters and announcements of ebooks and online courses!